It was just an acceptance speech, one being given after she received the 2008 Matrix Award from New York's Women in Communications. She was alongside other luminaries, important women like Diane von Furstenberg and Christiane Amanpour. But when it was time for food journalist Ruth Reichl to speak, she shocked the audience. But my mother was a great example of everything I didn't want to be, and to this day I wake up every morning grateful that I'm not her. Grateful, in fact, not to be any of the women of her generation, who were unlucky enough to have been born at what seems to me to have been the worst possible time to have been a middle-class American woman. Tell your most difficult stories: Reichl's mother was a horrible cook, almost "taste-blind." She was depressed and bipolar and not a particularly good mother in many respects. But by having the courage to talk about how that motivated and shaped her own success, Reichl demonstrates what I mean when I talk about finding your voice as a speaker: If you can bring yourself to share your most difficult stories in a speech, you’ll have the most compelling content and a riveting voice. Don't go for the obvious: Award acceptance speeches are almost entirely predictable...and can easily bore the audience, especially if there are several to sit through. By not just thanking her mother but using her mother as a foil for her achievements, Reichl had the room in the palm of her hand. Say the things only you can say: No one, but no one, could have stood in front of that room and said, "Ruth's so grateful not to be her mother." But she could--and in doing so, shared an intimate and insightful part of herself that made the talk unique. A publisher approached her immediately, asking her to write a memoir of her mother. Later, on the book tour for what became Not Becoming My Mother: and Other Things She Taught Me Along the Way, Reichl recreated the speech--a gift to this blog, since the original wasn't recorded--and talks about the reactions to it, in the video below. You also may want to listen to the audiobook version , or read the speech text in this NPR excerpt from the book. 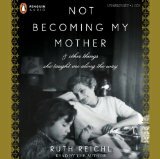 Reichl also talks about her mother and the book in this NPR Fresh Air interview. What do you think of this famous speech?